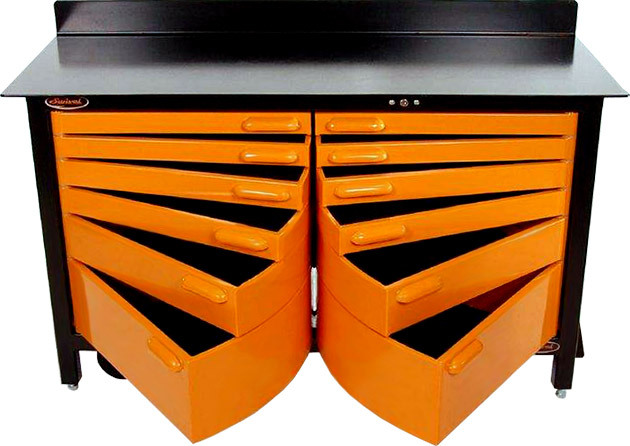 When it comes to tool storage, make an investment for the long term with the Swivel Tool Storage ($TBA). This brawny storage is cleverly built with heavy-duty drawers that swivel open, unlike traditional tool drawers that slide in and out. Other features include a 14-gauge steel construction, 1/4-inch thick steel bench top, tamper proof central locking system, anti-skid drawer mats, adjustable legs and a foot pedal that lowers casters to easily move the storage around the garage.